PennsylvAsia: Ryoichi Kurokawa and Novi_sad at Wood Street Galleries, from January 26. 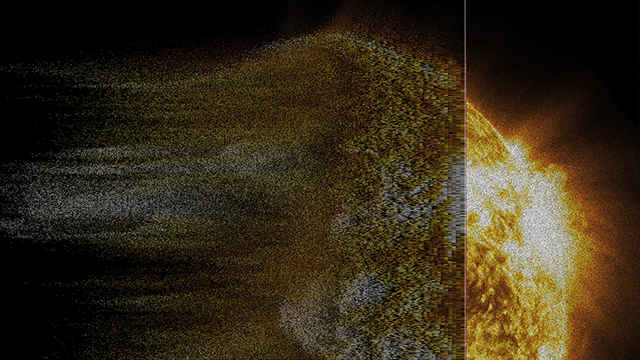 Ryoichi Kurokawa and Novi_sad at Wood Street Galleries, from January 26. Three installations by Ryoichi Kurokawa—two solo and one collaboration with Novi_sad—will be at Wood Street Galleries downtown from January 26 through April 8. Opening night will be free and open to the public from 5:30 to 10:00 pm as part of January's Gallery Crawl. Japanese artist, born in 1978, lives and works in Berlin, Germany. Kurokawa’s works take on multiple forms such as installation works, recordings, and concert pieces. He composes the time sculpture with the field recordings and the digital generated structures, and reconstructs architecturally the audiovisual phenomenon. In recent years, his works are shown at international festivals and museums including Tate Modern[UK], Venice Biennale[IT], Palais de Tokyo[FR], Transmediale[DE], EMPAC[US], YCAM[JP] and Sonar[ES]. In 2010, he was awarded the Golden Nica at Prix Ars Electronica in the Digital Musics & Sound Art category. The Wood Street Galleries website has lengthy introductions to the exhibitions. Wood Street Galleries is located at 601 Wood St. (map). Mitski at Cattivo, March 16.